If you are planning to build your own home solar power system to reduce your monthly electricity bill, you need to understand the key components of the system. A residential solar power system consists main of 4 key components which are the solar panels, charge controller, battery bank and power inverter. There are other smaller solar parts that support the entire system such as voltage meter, amperage meter, cut off safety fuses, disconnect switch and copper cables. For a home solar energy setup, you can’t use the power as when you needed it. Meaning, if you need solar power to run your television at night, you won’t be able to because there is no sunlight. The Photovoltaic (PV) cells can only work when the sun is out. Therefore, the system has to be setup up to harness all the energy during the day and store it in a battery bank so it can be used later. When you are building the battery bank, the best battery for the job is deep cycle type. 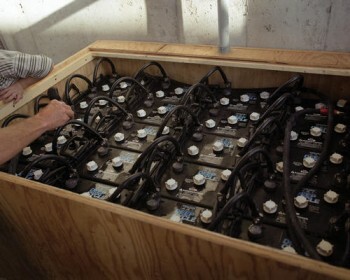 This kind of battery is mainly found on electric golf carts. They are very durable and can be discharged to a very low level without damaging its internal plates. One type of battery that I’ve seen to be suitable for a home solar power system is the 12 volt sealed battery from Advanced Gel Technology. The battery has 105 amp hour which will run your electrical appliances throughout the night. It is made from Absorbed Glass Mat (AGM) meaning it is sealed and would not have any spillage. Size wise, the battery is 12” x 6.6” x 8.2”. The battery measurement is pretty standard. Durability wise, it will last for 3000 charge cycle if you were to use it at 15% Depth Of Discharge (DOD). How many 12 volt batteries do you need for your home use? The actual number will depend on your power requirement. If you have multiple electrical appliances connected to the solar power system, you may need 4 – 6 units wired in parallel to provide you all the juice you’ll need. Because the Advanced Gel Technology is AGM, it costs more compared to other conventional deep cycle battery but it gives you a good level of convenience. How much does it cost? The battery is selling at $249.99 per unit from Amazon.com with free shipping. To get your unit of the AGM battery from Amazon.com, click here. Do you need some help to build your own home solar system? If you do, check out John Russel’s Power4Home guide. It comes with pdf e-books and High Definition (HD) step by step instructional videos. For more information, click on the link below. Yes, I also suggest the same that 12 volt sealed battery from Advanced Gel Technology is suitable for a home solar power system as the AGM batteries contain the electrolyte in a Boron Silicate fiberglass mat. This material acts like a sponge to hold the acid solution. This mat is in contact with the lead plates. The purpose is to encourage the recombination of any oxygen and hydrogen given off during charging and to suspend the electrolyte in a non spill manner.